The Tarot de La Rea, I must say, is a bit of an unusual deck when it comes to my reading with it. It's a TdM in structure, but between the switched elemental associations and kind of odd illustration of the pip minors, I initially had a bit of a hard time reading with it. Some might call it an 'art deck' but I don't believe in that concept: I either read with a deck, easily and regularly, or it does not stay in my possession. Then someone introduced me to the Comte de Mellet reading method. Historical one, it basically involves separating the majors and minors, and placing them in two stacks. You count up from Ace to King, and at each count turn over the top of the non-majors stack as well as majors...if the number you say matches the number on the minors/courts, you but the major-minor pair down as part of the reading. Otherwise you put them both in discard stacks and continue on, restarting the smaller majors stack as necessary until you finish the larger stack. You basically never know how many pairs you are going to get. I've gotten as many as eight and as few as one. Theoretically you can get zero, but I've never had that happen. Using this method with this deck, I've that the readings I get are consistently very, very accurate. It's interesting too because rather than asking a question, the deck just seems to...address whatever it is you need to know about/hear. 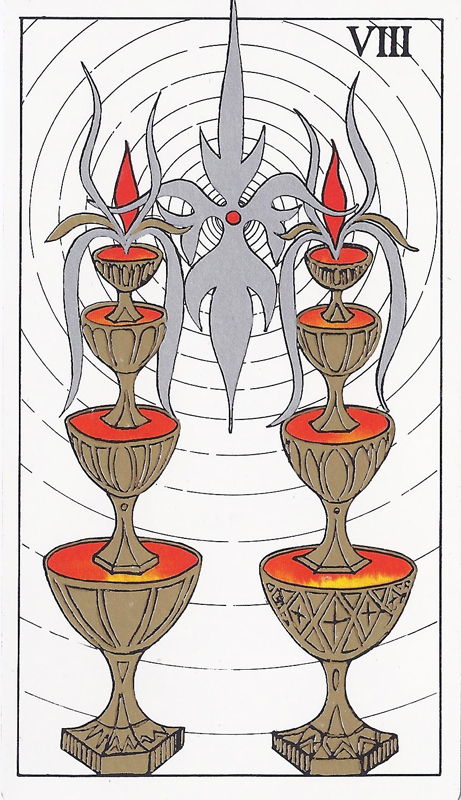 This morning, the spread gave me the following two pairs to ponder: Tower and Ace of Coins, Emperor and 8 of Cups. Now, a Tower paired with the Ace of Coins is not a very reassuring combination but, upon reflection and given the second set of cards, I am pretty sure this is not an omen of impending financial disaster as much as a not so gentle nudge. See, I had a pretty standard plan on starting grad school that would have had me graduating at the end of this spring semester. Late last Fall, after pondering some things, namely my rather unfortunate lack of professional experience in my field of study, I decided to spread out my classes so that I would be finishing last (thesis) course in the Fall so as to use extra time in Spring/Summer to get some real internships. A rather scary change in some ways, because as much as I feel confident in my ability to DO work well...job hunting, particularly in my field, is a whole other story. And well...the progress in actually applying to internship positions so far has been rather....lacking. Very lacking in fact. Opportunity, or disaster, this pair reminds me - what do I want? This is a plan that can get me far, or nowhere at all, depending on what I do. Applying to 'real' jobs is intimidating and not something I have much confidence for, but Change often requires the frightening - falling out of that tower, hitting the ground hard. The Tower of Academia, we could even call it here. I love school. I love learning, reading and writing and I feel confident in my abilities as a student. But staying in the tower is not enough to get me the kind of career I want. Academic experience alone is not enough in this economy, this field. I need experience, professional experience, internship experience. 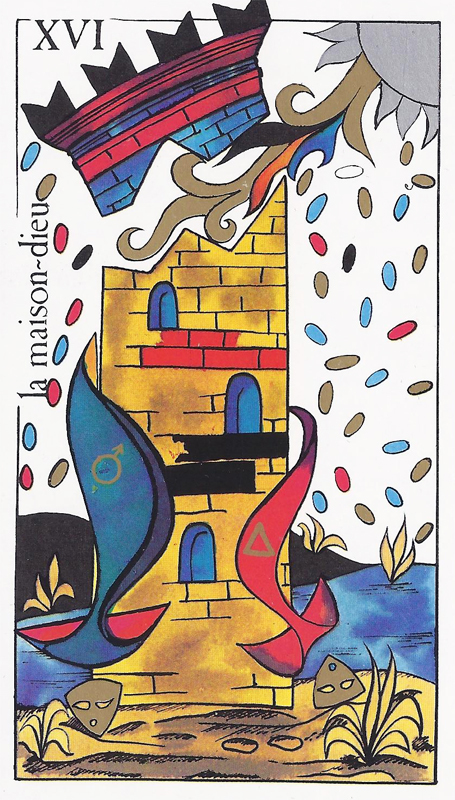 The Ace of Pentacles opportunity requires a Tower experience, making that change, getting out of the comfort zone, venturing out into the tower beyond the familiar confines. Am I doing enough with that? This pair reminds me that, despite the free time I've had over the last couple of weeks, the answer thus far has been No, No, No. 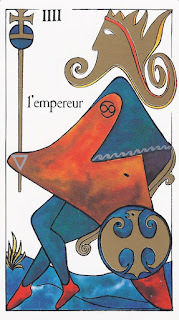 The Emperor here, for me, indicates a need to take things in hand - a need for some organization, control, self-discipline. The cancer symbol confuses me a bit, as this major is definitely not usually associated with THAT sign, but also makes me smile because well, cancer I am. 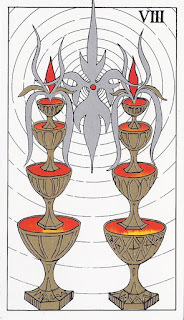 In the RWS system, the eight of cups is usually depicted as a figure departing, leaving something behind: what fears, insecurities, excuses should I be walking away from? 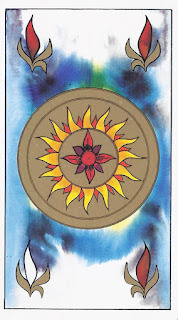 In the Thoth this card has a backdrop of dark, cloudy skies and a title of Indolence. Haven't I been a bit indolent as of late? I need a break, I tell myself. Tomorrow, tomorrow, tomorrow. Days pass and cover letters do not get written, applications remain unsent. Personal time is necessary, sure, but when there are things to do...well, self-discipline, time management indeed. 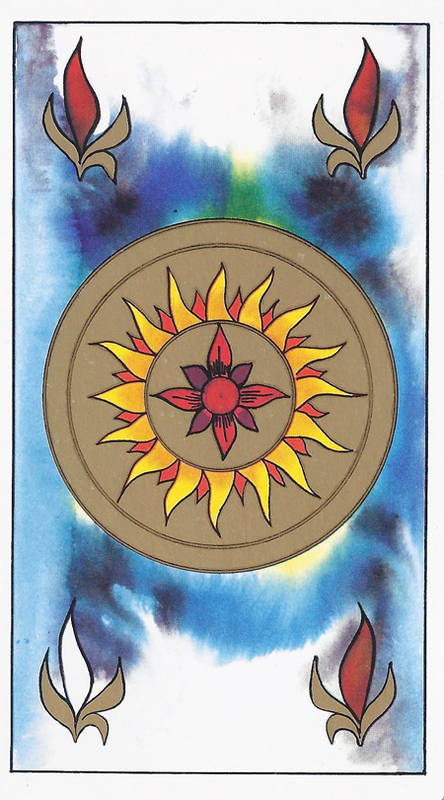 The number eight is associated either with Strength or Justice depending on the deck. In this one it is Justice, Adjustment - to balance out self-care, emotions, creativity with the getting done that need doing. A tall order, this walking away and overcoming indolence and balancing? Perhaps, but the Emperor shows that it can be down. Firmness is needed, a systematic approach - break things down into steps, write the to do lists, go.